Every woman knows dining room is more than just a place where meals is eaten. It's a separate little world that means a lot for any family. It's a place where everybody can gather and talk about future plans, discuss the past day, share news or funny stories. Psychologists have proved long ago that dinner is the best way to maintain peace and good relationship between family members. Certainly this is impossible in case your dining room is not convenient or cozy. On the other hand, if everyone feels comfortable, even simple meals seems to be much more delicious. The dining room is a place of delicate social situations that occurs between the most intimate of relationships. By first considering the psychological effects of the following colors, one can help to make the dining room a more relaxing place to eat and gather. The first thing to consider when choosing a dining rooms colors, are the effects they will have on appetite. The color blue is a well known appetite suppressant. This is because there is very little blue food found in nature. The color blue isn't exactly a weight loss program; it simply causes a slight psychological change that makes people feel less hungry. 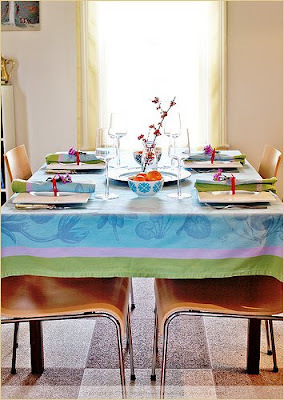 Avoiding this color will help guests to better enjoy they're meals.